Our last IsaU for 2017 wrapped up in Sydney this past weekend and what a finale it was. Packed to the brim with 300 Customer and Associates at the Intercontinental in Double Bay, we’re sure local residents won’t be forgetting Isagenix® anytime soon; the energy was electric! 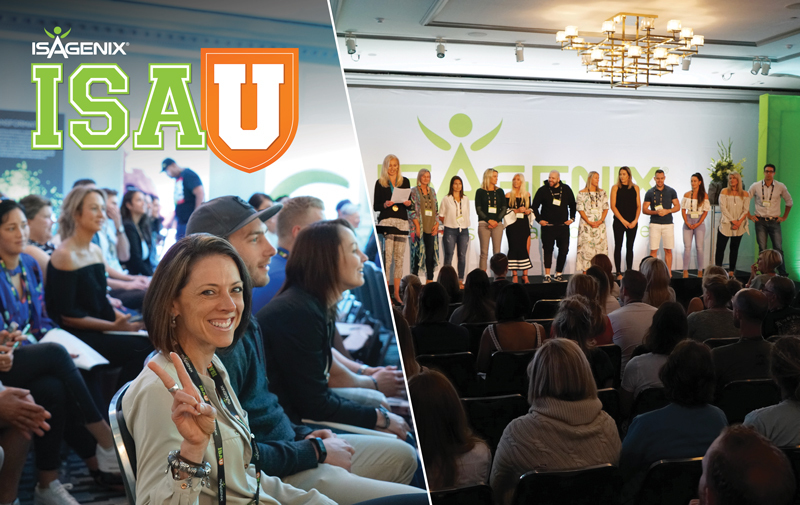 The weekend kicked off with a bang, with Regional General Manager of Australia and New Zealand, Mac ‘high-kick’ Larsen, sharing the Isagenix vision with attendees and setting the tone for the weekend ahead. We were blown away by Product Education Specialist, Dani Catania, as she shared invaluable knowledge about our no-compromise products and provided attendees with handy tips and tricks on our Product in the Spotlight, Cleanse for Life™ and everything needed for a successful Cleanse Day. Our Top Leaders owned the stage, bravely sharing their failures, successes and tricks of the trade. Isagenix Legacy Club Millionaire*, 12 Star Platinum, 13 Star Crystal Executive, Brett Davis encouraged attendees to step out of their comfort zone and break through barriers by getting them up and out of their seats and facing their fears head-on. Isagenix Legacy Club Millionaire, 8 Star Platinum, 2 Star Executive, Andrew Logan dove into assisting attendees with how to develop their story and Isagenix Legacy Club Millionaire, 9 Star Platinum, 6 Star Executive, Heidi MacAllan’s desire to inspire and create a community was experienced by everyone in the room, sharing how she builds her team with You Share, They Share, Repeat. With contribution at the forefront of what we do at Isagenix, attendees opened their hearts to Make-A-Wish® on Sunday, raising an amazing $3,089 for the organisation that grants wishes and brings hope to seriously ill children. Isagenix ANZ would like to thank all our Customers and Associates who gave so generously at IsaU Sydney, with a special mention to 2 Star Golden Circle, Executive, Leanne Doherty for bravely sharing her story onstage about the positive impact Make-A-Wish had on her family. Friendships were made, knowledge was shared and belief was built at IsaU Sydney. UIA Auckland is right around the corner, taking place 17 November to 19 November, so if you’re eager to build your business, grab your tickets today. Don’t forget, Celebration tickets are still discounted until 31 December – don’t miss out on this opportunity! Head to ANZ.IsagenixEvents.com or your Back Office to get your hands on your UIA Auckland and early bird Celebration tickets before theyre all gone!